“Our society tries to conceal racism by numerous devices. Academic institutions raise the cry of ‘excellence.’ Medical institutions today which ignore black students and the health of black Americans cannot be considered excellent,” Moses Alfred Haynes, MD, MPH, wrote in the August 1969 Journal of the American Medical Association. These words resonated deeply with Alvin Vernon Thomas, Jr., MD, who was then a young faculty member at University of Michigan Medical Center, and would serve to inspire a career dedicated to caring for the underserved in the inner-city areas of Los Angeles and Washington, D.C., as well as addressing the shortage of minority clinicians and researchers. Dr. Thomas, the longtime chief of pulmonary and critical care medicine at Howard University Hospital who is now semi-retired, is chair of the Society’s new Health Equality Subcommittee of the Health Policy Committee. The subcommittee is charged with creating a plan for addressing health equality issues, an initiative launched by ATS President Patricia W. Finn, MD. He is recognized by his colleagues as an outstanding choice to lead the effort. 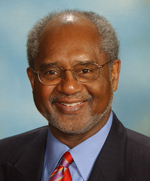 After completing his internship, residency, and fellowship under mentors Winthrop Davies, MD, Robert Green, MD, and Jack Weg, MD, at Michigan in 1976, Dr. Thomas’ understanding of health and social problems in the inner city grew when he joined the faculty of the Charles R. Drew Postgraduate Medical School and began seeing patients as the medical intensive care unit director at the school’s Martin Luther King, Jr. General Hospital. These days, Dr. Thomas is gradually winding down his clinical visits. But his work as chair of the Health Equality Subcommittee has just begun. With his insight and experience, the ATS will be better positioned to address the issue of health disparities as it strives to guide the field of medicine to the true definition of excellence. The chair of the Society’s first Health Equality Subcommittee of the Health Policy Committee previously served in the ATS Pulmonary and Critical Care Training Committee, and as president of Metropolitan D.C. Thoracic Society, and in the executive committee of the Maryland Thoracic Society.